I was commissioned to do a painting of the Comox Glacier for a client, but it had to tell a very special story. I won’t get in to too many details, but it’s a story of two young lovers that took a boat to a nearby island and spent a wonderful time together, including watching the sun set behind the Comox Glacier. With this in mind I wanted to create a special mood for this painting. It had to not only include beautiful rich colours, romantic lighting and contrast, but had to reflect a very specific view from the island they were on. Because I don’t have a boat readily available to go take reference photos, this left a lot to the imagination. 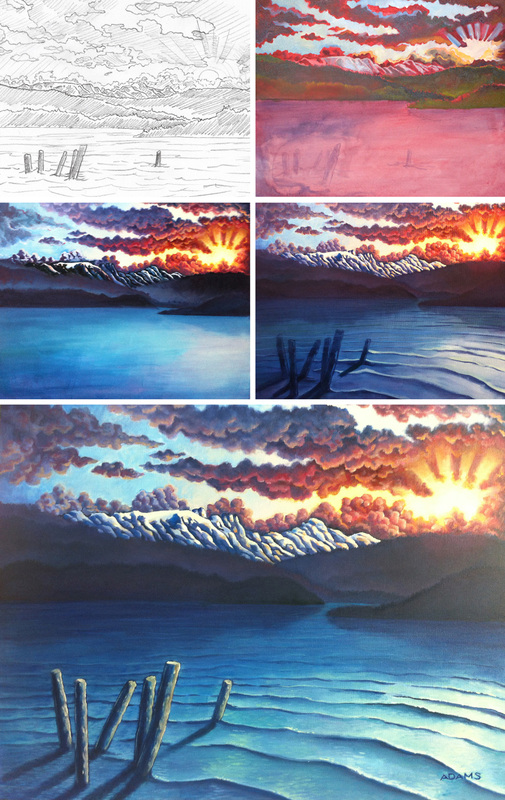 I looked at a lot of reference of the glacier, sunsets, clouds, and water, to combine into the scene I wanted to create. After a few rounds of pencil sketches with the client, we had the right scene and composition to get started. Here’s a bit of a look into the process of this painting. The main challenge I had with this painting was trying to create the light source from nothing. I had reference of the shape of the glacier and surrounding landscape, but nothing that had the angle and a sunset where I wanted it. I wanted it to be a little surreal, but still seem real enough that the client felt like they were back on the island every time they looked at it.